This impressive 18' double lane dry slide is a dual dry slide guaranteed to add tons of excitement and acceleration to any indoor or outdoor event. Great for promoting friendly competition or group challenges, kids can climb together up the left side climb, and then choose a left- or right-sided slick slide, for a fast-track ride to the cushioned bottom with a safety stop. Hooded safety on top makes sure riders slide down properly. 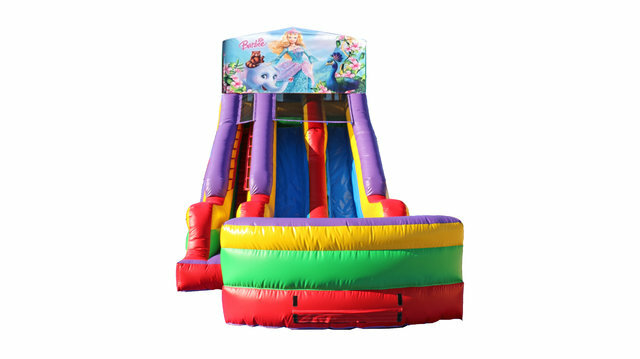 The bright and colorful red-purple-yellow-green and blue fits into any décor, sure to attract guest for a thrill-filled day, and keep the kids sliding! This theme gives you 360-degrees of brilliant and joyful regal fun! Perfect for kids at birthday parties, family reunions, company picnics, church celebrations, or any special event! Kids will have a grand time ruling and making friends on this 18' dry slide. All of our bouncers are cleaned and sanitized before your rental.